The Lakeside Craft Shops of Sheboygan, Wisconsin was founded by Fred Dennett in 1912 when he was 61 years of age. Dennett had already made his fortune as founder of the Wisconsin Chair Company, and he held investments in many other enterprises. The Company's motto was "Art in the Home." 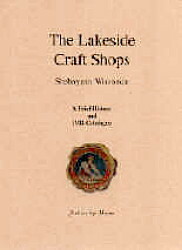 The Lakeside Craft Shops made home furnishings in the Arts and Crafts style, including fern dishes, bracket hanging baskets, book racks, cellarettes, card tables, waste baskets, stools, jardiniere stands, window boxes, smokers stands, serving trays, and umbrella stands - in oak and mahogany. This book includes a scholarly, illustrated history of the company and contains the company's 86-page 1912 catalog. Softcover 95 pp, see below to order. Cincinnati was an important center of the American Arts and Crafts Movement. Reproduced here is the entire 1906 catalog of the Oscar Onken Company showing sophisticated furniture in the �mission� style, some pieces featuring inlay. 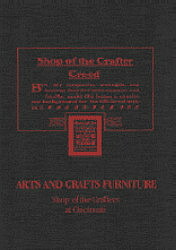 Shop of the Crafters furniture was promoted vigorously and consequently was widely distributed throughout the United States. A central European influence can be detected in some of the pieces, particularly when viewed in the context of the catalog�s illustrated Viennese room settings of the period. This book shows a rich variety of designs as an alternative to the pure rectilinear forms often seen in other Arts and Crafts mission furniture. Kenneth Trapp, formerly with the Cincinnati Art Museum, has written an Introduction discussing the company and its history in Cincinnati. Softcover 72 pp, see below to order. Most Arts and Crafts enthusiasts know that the Tobey Furniture Company briefly marketed Gustav Stickley's so-called "New Furniture" for a few months beginning in the fall of 1900. That is all that most people ever hear about the Tobey Furniture Company. But there is much more to the story. The Tobey Furniture Company was in business for ninety-eight years, from 1856 to 1954. Tobey sold not only Gustav Stickley's "New Furniture", but also "mission" or Arts and Crafts funiture manufactured for Tobey by Leopold and John George Stickley, which Tobey sold under its "Russmore" trademark. Tobey also sold "mission" or Arts and Crafts furniture that it made in its own workshop, promoting it (as well as other styles of furniture) as "Tobey Hand-Made Furniture." The Tobey brothers, Charles and Frank, were leaders in the Chicago business community and in the national furniture industry. Tobey's general manager, George Clingman, for a time also the company's chief buyer and designer, was granted patents for his "mission" or Arts and Crafts furniture designs, including a patent for the iconic "Tobey Chair." 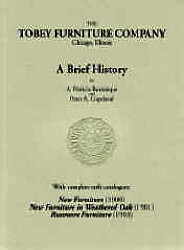 This book provides not only an illustrated 38-page history of the Tobey Furniture Company, but also provides for the first time unabridged reprints of Tobey's 1900 New Furniture catalogue, Tobey's 1901 New Furniture in Weathered Oak catalogue, and Tobey's 1903 Russmore Furniture catalog. Softcover 182 pp, see below to order. We have reprinted a very limited number of copies of this rare 68-page catalog featuring 158 different pieces of Arts and Crafts furniture. 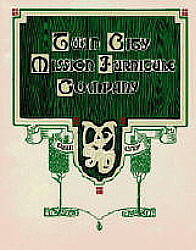 The Twin City Mission Furniture Company was established in the St. Anthony Park section of St. Paul, Minnesota in 1909. The company produced chairs, footstools, library tables, bookcases, bookstands, small tables and taborets. Much of the company's production helped to furnish the homes and churches of St. Paul, Minneapolis and the surrounding counties. Examples of the company's mission furniture turn up from time to time. One piece is in the collection of the Minnesota History Center in St. Paul. Softcover 68 pp, see below to order. This furniture manufacturer had an interesting history and produced a unique line of Arts and Crafts furniture � all recounted in a detailed, illustrated Introduction by authors Jill and Michael Clark. Indian Splint furniture is mission style furniture that used woven ash or oak splints in the place of solid wood surfaces. Aesthetically, this furniture is very pleasing, ideally suited to an Adirondack or Upper Peninsula lodge. It offers a refreshing alternative to the traditional �springs and leather� mission furniture of most other manufacturers. Softcover 96 pp, see below to order. Living and working in Chicago, Robert Jarvie was heavily influenced by Prairie School architecture with its floriform terra cotta ornamentation and contrasting modern lines. Jarvie was also influenced by Arts and Crafts furniture and the west coast handcraft tradition in metalworking. From this amalgamation of influences, Jarvie created a distinctive group of objects that represent American Arts and Crafts in a uniquely Midwestern style. This book presents the exquisitely wrought brass, copper, and bronze articles of Robert Jarvie. 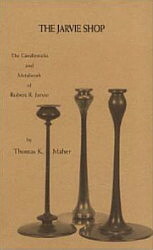 The candlestick is a functional article; Jarvie formed it into a work of decorative art that to this day is widely appreciated and admired for both its usefulness and aesthetic value. The centerpiece of the book is a rare 1906 Jarvie Shop catalog. Thomas K. Maher is the author who did the primary research for the book. Softcover 136 pp, see below to order. 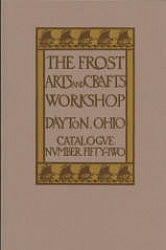 The Frost Arts and Crafts Workshop was founded by George W. Frost in Dayton, Ohio around 1906. The company started out making "various useful articles of unusual design" in metal and wood, and the business grew very quickly. By 1909 the company employed more than forty workers and had moved to a new three-story brick building overlooking the Miami River. 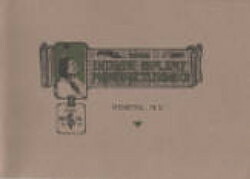 By 1910 the company was making and selling desk sets, smoker sets, etched mottoes, picture frames, bowls, trays, bookends, sconces, clocks, lanterns, jewelry and jewelry boxes, and lamps that were available in more than five hundred department stores, jewelry stores, and other retail outlets throughout the United States and Canada. Reprinted here is a faithful reproduction of the company's Catalogue Number 52 from 1910 showing the breadth of the Frost Workshop's finished offerings at perhaps the zenith of the Arts and Crafts movement in America. Softcover 32pp, see below to order.